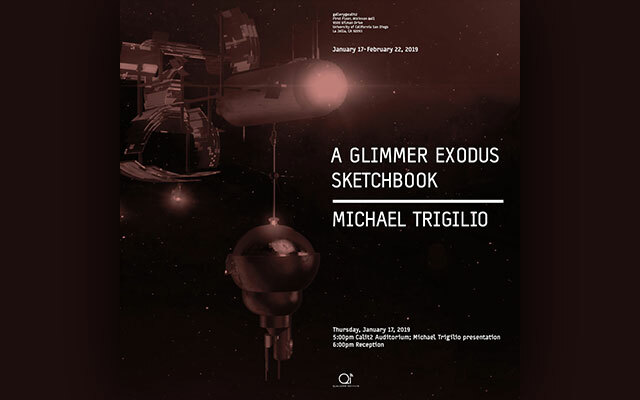 A Glimmer Exodus Sketchbook, by Michael Trigilio, opens on January 17, 2019 at the Qualcomm Institute at UC San Diego. The exhibition weaves together more than a dozen works in various media exploring speculative realizations of intergalactic travel, planetary exodus and themes of political uprising. A Glimmer Exodus Sketchbook by Michael Trigilio, an associate teaching professor in UC San Diego’s Visual Arts Department, weaves together more than a dozen works in various media exploring speculative realizations of intergalactic travel, planetary exodus, and themes of political unrest. Since 2017, Trigilio has been developing a long-form narrative project based on his serialized science-fiction novel,Glimmer: Verse One of the Blockchain Elegy. The works in this exhibition are polished “sketches” that illuminate the sounds, landscapes, vessels, and visualizations born in the world of the novel. Also included as part of the exhibit is Trigilio’s 2017 short film, 12 Transmissions from the Occupied States Orbiting the Sun, an animated piece that forges a central conceptual link to the themes of political rage and uprising found throughout the exhibition.